"The most exciting cinematic take on contemporary race relations since 'Do the Right Thing' nearly 30 years ago." - Variety. "Superb and daring ..." - Village Voice. "...ought to be seen by the widest audience possible." - New York Times. Convicted felon Collin (Hamilton’s Daveed Diggs) is closing out his probation period when his life shatters around him. Heading home for his curfew, Collin becomes the sole witness to a white police officer killing a black citizen. To make matters worse, his childhood friend, Miles (Rafael Casal), is on a dangerous path of recklessness and anger. What follows is an explosive confrontation that could put both of them away. 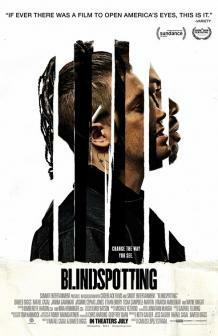 Blindspotting stars and co-writers, Diggs and Casal, based their screenplay around their childhood in Oakland, in the tradition of socially aware comedy-dramas like Do The Right Thing. Over a decade in the works, it’s a portrait of Oakland’s culture and community, and a searing indictment of police violence, racism, and gentrification.